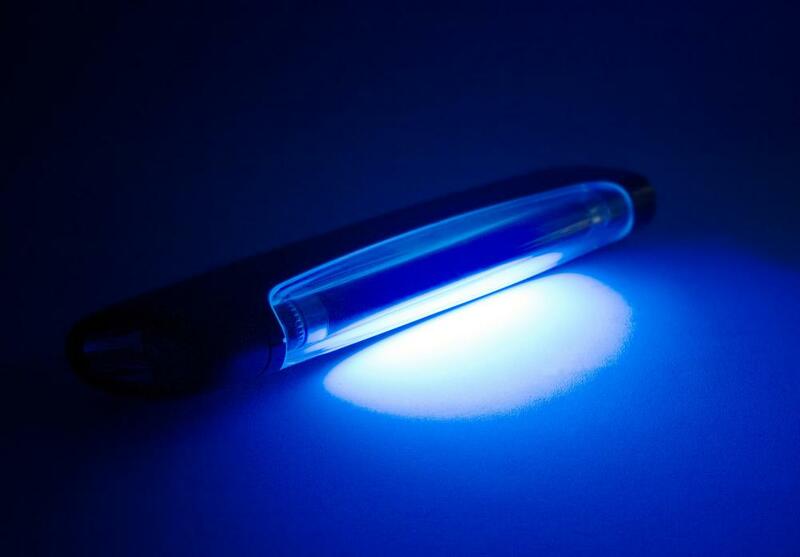 What is an Ultraviolet Lamp? Ultraviolet lamps can be used to improve skin texture. Ultraviolet lamps are used in tanning beds to create an even tan. Black lights utilize ultraviolet light. An ultraviolet lamp (UV lamp) is a lamp that emits light outside of the visible light spectrum. Though it may seem like such a light serves no useful purpose, an ultraviolet lamp can be used in applications such as security and decontamination, a complex industrial application, which has a direct effect on people's safety. These lamps may be situated in a fixture much like any other lamp, but ultraviolet bulbs will look different, usually having a darker color. Ultraviolet light is that area of light that is beyond the blue portion of the spectrum. The wavelengths are shorter, which accounts for the difference when compared to infrared and visible light. An ultraviolet lamp projects this invisible form of light by using special filters or processes inside the light that produce the desired wavelength. They can fit standard fixtures or be specialized products. In some cases, an ultraviolet lamp is also known as a black light. These lights do produce some light that is visible to humans, but the main job is to put out ultraviolet light. Such invisible light is often evidenced as a visible light once it hits an object, which then tends to "glow." These lights are useful when adding security features to documents and even getting a hand stamped going in and out of a theme park. In other cases, a water purification process may use a black light. Much like ultraviolet light can affect the cellular structure of humans, as evidenced by a sunburn, it can also affect the cellular structure of bacteria. Therefore, bacteria in water that is flooded with an ultraviolet lamp will often die, though this may be dependent on the type of bacteria, the strength of the light and the time exposed. In this way, water can be purified without the harsh taste that chemicals use. Despite the overall harmful effects of ultraviolet lights, lamps can be used on a limited basis on humans. For example, ultraviolet lamps are often used in tanning beds to help individuals tan more completely and quickly. Ultraviolet light therapy can also provide some help in the removal of fine lines and wrinkles, at least to a certain extent. At the same time, ultraviolet light can also damage the skin and be a cause of premature aging. Those interested in buying an ultraviolet lamp can often find models for sale at a local party supply store or novelty shop. They serve as a way to illuminate objects painted in fluorescent colors, and cause things to have that glowing appearance, purely for entertainment purposes. Lamps may also be available for some ultraviolet home water purification systems. What Is an Infrared Lamp? How Do I Choose the Best UV Curing Lamp? What is Ultraviolet Light Therapy? What is a UV Meter? What is a UV Bulb?